A far-reaching legislation has been introduced in the US Congress that would deduct $50 million from the aid to Islamabad for every American killed by terrorists operating from the safe havens in Pakistan with the "support" of the ISI. Congressman Dana Rohrabacher who introduced the 'Pakistan Terrorism Accountability Act of 2012' in the US Congress. Pakistan Prime Minister Yousuf Raza Gilani cannot be stopped from performing his duties as the Supreme Court did not disqualify him when it convicted him for contempt, the High Court here has observed. There is no mention of Gilani's disqualification in the Supreme Court's detailed judgment regarding his conviction for contempt for failing to reopen graft cases in Switzerland against President Asif Ali Zardari, the Islamabad High Court noted. The Syrian National Council (SNC), a fractious umbrella group opposed to President Bashar al-Assad, gathered on Saturday for three days of talks aimed at deciding on its own leadership and shoring up its credibility at home and abroad. Indian American Pradeep Khosla, an IIT alumnus, has been named as the eighth Chancellor of the University of California (UC), San Diego. Khosla, 55, is currently working as the Dean of College of Engineering at Carnegie Mellon University. UC President Mark Yudof made the announcement of Khosla's appointment, which will be confirmed by the university Board of Regents on May 16, Lynn Tierney, UC's vice-president of communications, told India-West. The Internet is not a law-free zone, the British government's top law officer warned Twitter users yesterday, adding that he would not hesitate to take action over offending posts. Attorney General Dominic Grieve, the government's chief legal advisor in England and Wales, spoke out following a series of high-profile court cases involving postings made on the micro-blogging site. "Pakistan has for decades leveraged radical terrorist groups to carry out attacks in India and Afghanistan," Congressman Dana Rohrabacher said introducing the 'Pakistan Terrorism Accountability Act of 2012'. The legislation would require the Department of Defence to list all Americans killed by terrorist groups operating with impunity inside Pakistan and Afghanistan and supported by elements of Pakistani government. For each person killed, $50 million would be subtracted from US foreign assistance to Pakistan, a requested $2.2 billion, and given to the victim's family. "For too long America has funded the Pakistani government, giving it free money, while elements of the ISI and Pakistan's military operate radical Islamic groups that are actively murdering Americans. Americans will not accept this," Rohrabacher, Chairman of the House Foreign Affairs Oversight and Investigations Subcommittee, said. "Pakistan helped to create the Taliban and Pakistan's intelligence service hid Osama bin Laden from the US for years. Today, one of the most dangerous and sophisticated groups killing American troops in Afghanistan is the Haqqani Network, which is closely operated by the Pakistani government," Rohrabacher said. The legislation says Pakistan, through ISI, maintains control and influence in Afghanistan through militant groups like Haqqani network, to secure its strategic position and expand its sphere of influence, not only in Afghanistan, but also in Kashmir and against India. Asserting that ISI has strong links with the Haqqani network, the legislation said that it shall be the policy of the US to limit the United States foreign assistance to Islamabad if Pakistan's military or intelligence services continue to support or provide assistance to organisations that target American citizens. The legislation says it shall be the policy of the US to limit foreign assistance to Islamabad if Pakistan's military or intelligence services continue to support organisations that target US citizens. Pakistan Prime Minister Yousuf Raza Gilani cannot be stopped from performing his duties as the Supreme Court did not disqualify him when it convicted him for contempt, the High Court here has observed. There is no mention of Gilani's disqualification in the Supreme Court's detailed judgment regarding his conviction for contempt for failing to reopen graft cases in Switzerland against President Asif Ali Zardari, the Islamabad High Court noted. It further observed that the apex court had referred the issue of disqualification to other constitutional forums. Two SNC executive committee members, Samir Nashar and George Sabra, said the council was discussing whether to reelect Burhan Ghalioun, its president since it was set up in exile in August. 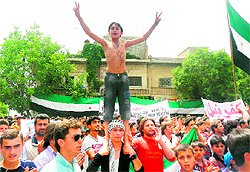 The Paris-based academic has been criticised for being out of touch with the opposition inside Syria and for failing to unify the SNC, which has yet to win full international recognition as the Syrian people's legitimate representative. "We are in heated discussions over the presidency ... We are against an extension or a renewal of Burhan Ghalioun's term," said Nashar, a member of the Damascus Declaration, a faction within the SNC. "We are in favour of transition because it gives all the various Syrian political components a chance in the post," Nashar told Reuters in Rome, where the SNC was meeting. Nashar, who left Syria after an initial arrest in Aleppo in 2006, said he favoured Sabra to lead the SNC "for many reasons, mainly because he is an opposition member from inside Syria". Interviewed separately, Sabra declined to say if he was a candidate, but advocated radical reforms for a group that has been prone to political wrangling and a lack of transparency. Indian American Pradeep Khosla, an IIT alumnus, has been named as the eighth Chancellor of the University of California (UC), San Diego. Khosla, 55, is currently working as the Dean of College of Engineering at Carnegie Mellon University. UC President Mark Yudof made the announcement of Khosla's appointment, which will be confirmed by the university Board of Regents on May 16, Lynn Tierney, UC's vice-president of communications, told India-West. Khosla is expected to be confirmed without opposition from the board, she said, adding that he will hold a press conference at the UC San Diego campus May 19 to discuss his new role. Neither Yudof nor Khosla can comment on the appointment until after the May 16 confirmation, Tierney said. "In slightly more than 50 years, UC San Diego, under the leadership of Marye Anne Fox and her predecessors, has become one of the world's top universities," Khosla said in a press statement. "I feel fortunate, humbled and energised to have the opportunity to contribute to that excellence while embracing the challenges of integrating world-class research with an undergraduate educational experience that will remain accessible to all, regardless of family income," he said. Khosla, originally from Mumbai, has earned his MS and PhD degrees in electrical and computer engineering at Carnegie Mellon in 1984 and 1986 respectively, after graduating from the Indian Institute of Technology with a bachelor's degree in electrical engineering in 1980 and working for two years in India as an engineer. "If somebody goes down to the pub with printed sheets of paper and hands it out, that's no different than if somebody goes and does a tweet," Grieve told BBC radio.